The Thorilla is the seventh type of gorilla that can be found. Like all level 9 animals, it requires the player to upgrade the respective habitat to level 9. The Thorilla dons a full bodysuit of armour mostly coloured either mauve, silver or dull golden yellow. The majority of its torso armour is mauve, with the breastplate, sides, back and arms coloured mauve. The shoulder plates are coloured silver and lined with gold on all sides, and the cuffs have metal-resembling bands which are coloured gold as well with gold hexagons as decoration. Around its waist it has a gold belt coloured in the same way as its cuff bands. Its pants and legs are coloured the same way as the torso armour. The Thorilla wields an octagonal hammer lined with gold with a dark grey handle, and wears a short red cape around its neck. Its silver helmet is shaped like Thor's helmet with small white backwards-facing wings at the back of the helmet, and like the other pieces of armour it is lined with gold. Like the Volcanorilla, the Thorilla also has the sparks spitting out from the centre of its body. Does Thorilla look to be in a gaming mood? Sky Zoo upgraded to Jungle 1. Gorilla habitat upgraded to level 9. Ride past 1300m in Jungle. Note: Its chance of appearing is very low due to it being a tier 4 animal. It will appear randomly but not often, and doesn't appear before 1300m. The Thorilla is an obvious play on Thor, a Norse mythical god associated with thunder and strength. The appearance is based on the film version of 'Thor'. 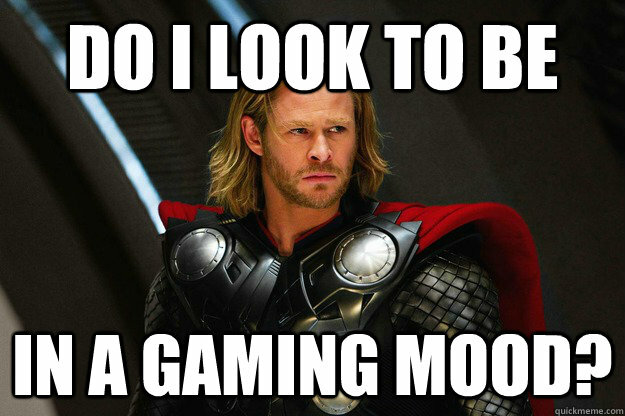 The description is a reference to an internet meme which was created after viewers of the 2011 'Thor' film found the quote "do I look to be in a gaming mood" funny. This links back to Rodeo Stampede in that Rodeo Stampede is a game itself. Example of one of the memes here. The Thorilla was released on the 8th of September 2016 in version 1.2.0, along with all other Savannah, Jungle and Mountains level 9 animals.